Retired four-star general and superintendent of the Virginia Military Institute J. H. Binford Peay III released a memorandum to cadets, parents, and faculty following the Washington Free Beacon's bombshell report that the famed military academy was offering coloring books to cadets to deal with stress before finals. The 700-word memorandum discussed the institute's "Behavioral Health Programs," which include "intricate designs" that can be used to color. The memo was a response to "recent social media," two days after the Free Beacon reported on the school having coloring book stations for cadets to "unwind and relax" before finals, which left the VMI community in turmoil. Gen. Peay said the "Stress Busters" program allows cadets to "utilize a yoga certified instructor" and includes a 38-word description of a coloring page, which he insists is not a coloring book. The institute argues the program is part of their campaign to combat suicide and mental health issues among the young cadets. "The Virginia Military Institute is committed to the well-being of all VMI cadets, faculty, staff and our employees while adhering to the requirements of our rigorous, tough, Spartan environment," wrote Gen. Peay. "VMI continues to have one of the hardest four year academic, physical and discipline experiences in the nation." "The reality is that suicide rates and mental health issues continue to be on the rise, particularly for young adults," he said. "While our losses in cadets, staff, faculty, and employees over my fourteen year tenure have been small … and one is too many … VMI has not been exempt from these tragedies." Gen. Peay said VMI faces "mental health issues daily," and implemented "Behavioral Health Programs" to combat issues such as nutrition and anxiety. "The Institute took the initiative several years ago to implement a series of optional courses, best practices, bystander intervention, and other actions that have been proven to successfully treat the members of our armed services suffering from similar conditions … and are also seen on campuses across the country," Peay said. "VMI believes it is appropriate and has a responsibility to expose our cadets to a various set of life skills, including methods of dealing with the implications associated with substance abuse, depression, nutrition, sleep deprivation, stress and anxiety." Gen. Peay said "the holidays and exam periods" can make cadets more stressed, as a reason to justify the "Stress Busters" program. "No one should assume that VMI coddles its cadets or has become soft," Gen. Peay said. "In fact, the Institute is more difficult academically and physically than my time years ago … and I am proud these young men and women elected this difficult path strewn with challenges far different from many of their high school classmates and contemporaries … and far different than our time." The memo argued "Stress Busters" has been "inaccurately portrayed." The memo does not address the fact that VMI removed its own description of the program from its website, which described the "stress reduction activities," including "coloring book stations," after the Free Beacon‘s initial report. "Recent social media postings have inaccurately portrayed the ‘stress busters' program as including coloring books," Gen. Peay said. "A far more accurate and realistic description of our efforts are as follows." Gen. Peay then defends the activities, noting that they do not involve coloring books, but only a coloring page. "There are no coloring books available or distributed," he said. "There is a one sheet handout with an intricate design that may be used to color, within discreet, small lines as part of the information packet along with other modalities that are recognized as ways to reduce stress. This technique has been used in programs across the nation and is backed by data as to its effectiveness." The statement contradicts what the school explicitly stated on its website. 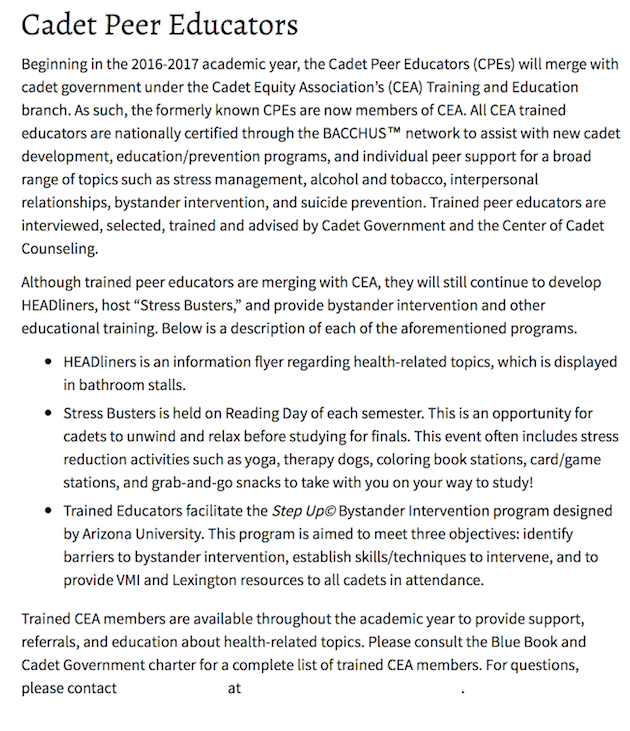 The "Cadet Peer Educators" page said "Stress Busters" includes "coloring book stations," before the school deleted it. 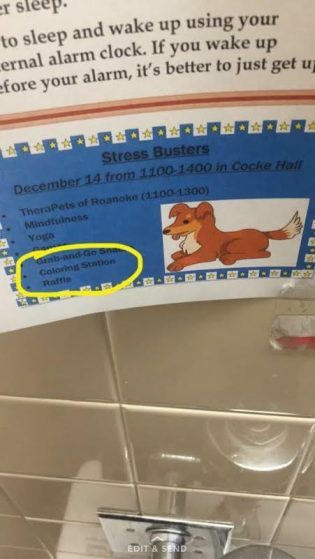 In addition, a flyer with a cartoon puppy posted in a bathroom at VMI advertises "Stress Busters" as having a "coloring station," as well as mindfulness. A Cadet Peer Educator, part of the group that hosts the event, also explicitly said coloring books are offered. Gen. Peay's long and decorated military service includes two tours in Vietnam, and command of the 101st Airborne Division during the Gulf War. He received numerous military awards, including the Silver Star and Purple Heart. Many distinguished military leaders attended VMI, including Gen. George S. Patton and Lt. Gen. Lewis Burwell "Chesty" Puller. Stonewall Jackson was a professor for 10 years before the Civil War. Gen. Peay also said "Stress Busters" is optional, and lasts for three hours on Reading Day, which occurs once each semester before finals. The program provides pamphlets on tips for nutrition and quitting tobacco. "Many come through in small groups of roommates or study mates and spend a few minutes socializing or petting a certified service dog," Gen. Peay said. "Many cadets use their time to go on a long run or lift weights in the gym." "Some will utilize a yoga certified instructor," he added. "Teaching cadets how to manage stress is not mutually exclusive with creating a stressful, challenging, demanding educational experience that we provide at VMI," Gen. Peay concluded. "Men and women that effectively manage stress are not weaker, but stronger." After the statement was circulated at the school's Facebook page, one commenter said the memo was well written, but raised concerns about where to draw the line between "coping mechanisms" and "coddling." "I understand the concept of offering cadets stress coping mechanisms, and maybe there should even be a day or so of this for matriculating Rats," the commenter said. "However, it seems to me the pressure at the Institute used to serve the purpose of weeding out those who could not hold up under the rigors of combat or military life. It sounds harsh but that was probably a good thing." "It's never shameful to teach students how and where to seek help or that there [are] valid coping mechanisms but this does sound a bit like coddling," the commenter added. "Puppy play and snacks and an ‘intricate' designs for coloring."